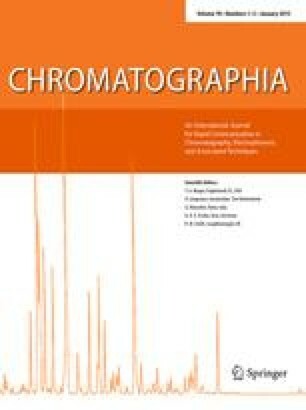 The normal-phase chromatographic retention behaviour of polyesters on bare silica and on a polymer-based polyamine (PA) column has been studied with a variely of binary mobile phases under isocratic conditions. The dependence of experimental retention data on the degree of polymerization (p) and on mobile phase composition (φ) was characterized by to an approach developed by Jandera et al. The bulky repeating unit and the relatively highly polar end groups of the polyesters both had a large influence on retention behaviour. The two effects in combination explain the molar-mass-independent retention observed experimentally at a particular mobile phase composition for all the mobile phase—stationary phase combinations investigated. These conditions were found to be independent of the type of end group. End group separation on a silica column improves when the polarity of the less polar solvent is increased. End group separation is better on the PA column because of a greater difference between the adsorption energy of the alcohol and acid end groups. Better prediction of retention data on the PA column was achieved by use of an approach which assumes two different types of adsorption site. Results enabled further understanding of retention behaviour in normalphase gradient polymer-elution chromatography (NPGPEC) and explained both the dependence of the order of elution onp and differences between the end-group selectivity of different systems.